Collage (From the French word, coller, to stick) is the assemblage ofdifferent forms creating a new whole. This section will help get you startedwith collage and give you a few ideas. While you can use oil-based materials,most artists use water-based material, especially acrylic, for collage. You can collage on about any surface. Popular base materials include paper,canvas and wood panels. If you use paper, try 300 pound watercolor paper or ragmat board. The thicker surfaces are less likely to buckle. We use a lot ofgallery wrapped canvas. The cradled Ampersand panels are one of my favorites, but they are somewhat expensive. Since we are going to assemble our items, we need to attach them. The best overall adhesive is Golden Matte Medium. Matte medium is essentially acrylic paint without the colored pigment. It's archival and holds very well. You will use a lot of it, so buy a 16 or 32 oz. jar. Use an old or inexpensive brush, a 1" or larger flat brush or an foam brush. It's somewhat hard on brushes - don't use your best sable watercolor brush! To attach, simply coat both the back of the piece to collage and the work surface. Brush it on, place it down and hold it for a few seconds. If you have a small piece to stick down, an art knife helps position it. For thicker paper, such as 140 lb. watercolor paper, use Golden Soft Gel (Matte). It has more holding power. 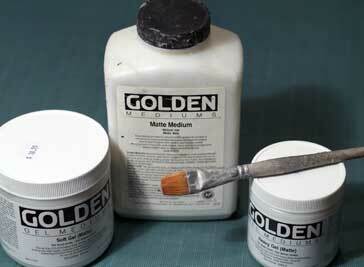 For even thicker paper or lightweight 3-d articles (keys, buttons, etc) use Golden Heavy Gel (Matte) medium. Other professional mediums by Liquitex and others should be fine too. Painted paper - You can paint original collage source material using watercolor or acrylic paint on paper. I find 90 lb. Arches hot or cold press works the best. It's thick enough not to buckle, and thin enough to easily paste down. It's a great way to experiment and sling some paint! I'll put a full sheet over a saw horse outside and pour acrylic paint with one hand and spray water with the other. Fun! Or try some texture with acrylic and alcohol spray or watercolor and salt. Collage is the perfect way to recycle less than great traditional paintings. Tear them up and paste them down! You can also draw with non-water based drawing materials such as charcoal, oil stick, colored pencils, or wax crayons (Caran DÕAche Neocolor I). You can also enter many juried watercolor shows with hand painted paper collage. You can also use water soluble crayons such as Caran DÕAche Neocolor II or water color pencils. Just don't use any found paper. A few groups, such as AWS will not accept any collage. Read all entry requirements very carefully. Photography - Being a photographer, one of my other favorite collage elements is original photographs. I don't paste down the original gelatin silver (B&W) or color-coupler prints, but a reproduction. It works better and I usually want to scale up the size. Low-tech approach - Simply take color photos to a copy shop or office supply store and get black and white photocopies made at the size you desire. It's inexpensive and works great. Want color? Just glaze a thin coat of acrylic paint and hand tint! If possible, copy on 100% rag paper. I have been using Southworth 100% cotton 32 lb. Resume paper. It will go through the copy machine and is fairly stiff. The copier toner is carbon, and archival. High-tech approach - Scan in your print (or negative) or download your digital camera to a computer. Modify the image and scale it any size you desire with Photoshop or similar software. Print it out on a black and white laser printer. A laser printer has a copy machine engine inside. This approach is very versatile. We have a HP 5000N laser printer in the studio, which prints 11" x 17", which is very handy. Laser printers are as low as $100! Need a larger image? Just tile it manually or automatically if your software supports it. Add color, as described above, if desired. Color - I have also been using color computer prints as collage material. Most ink jet printers are water soluable and will run. Some Epson printers use pigmented ink (called UltraChrome or K3) are archival and can be directly attached with matte or gel medium. Plus you can coat or paint on the image surface. It will not run or fade! It's very versatile. These printers start at $400. Printer technology changes rapidly, there be other brands available. Found paper - To get the most original art, use original source material! However, much of the charm and funk of collage is found paper. Found paper has a patina that is difficult to reproduce. You can use the above copy machine and computer resources to duplicate, modify and scale found paper and objects as well. Found paper can be anything of interest. Here are some ideas: Books, calendar pages, calligraphy, candy wrappers, craft paper, docments, drawings, engravings, envelopes, foreign printed material, game boards and parts, labels, graphs, graph paper, gold foil, letters (especially hand-written), labels, ledgers, tags, tissue paper, maps, matchbook covers, magazines, marblized paper, money (especially foreign), music (sheet music, music books), newspapers, patterned paper, paintings, postcards, receipts, rice paper, postage and postal marks, signage, theatre tickets, other tickets, wallpaper. And of course, Dover and other clip art books. 3-d objects - beads, bottle caps, buttons, cigar boxes, charms, fabric, keys, lace, jewlry, toys, shells, and yarn. Sources of found paper and objects includes antique stores, dollar stores, flea markets, garage sales, garbage cans, library book sales, thrift stores, and the streeet! I get a lot at annual library book sales and thrift stores. Important note - Found paper is it is often copyrighted! See the Copyright and Public Domain pages for more information.